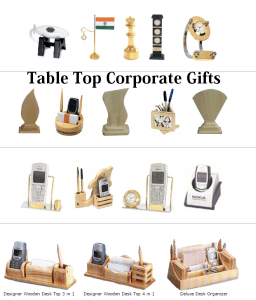 Conceptual Corporate Gifts to Increase Brand Recall! The pharma sector promotes their brands through the doctors and thus need a mechanism to get into the minds of their target audience the doctors. Pharma companies do so by identifying the USP of their product or the differentiate against existing available drugs to influence the doctors to start prescribing their new discoveries. For this they need a concept to work around and tell the story to their medical representatives who in turn start pass on the story to all doctors on their periodical visits. The story created as per the above concept has a touch point in the form of ideally a table top gift with the drug name to help the doctor recall and start prescribing the new medicine. After few prescriptions and feedback from the patients the doctor is in a position to recall the drug name comfortably thereby helping the new discovery and new innovations to serve the patients better. For example, a new drug which works very fast in the blood was needed to be communicated to the concerned doctors. The product team decided to use the fast bowling concept to convey the message to the doctors. Accordingly, a table top pen stand was conceptualized with cricket ball with hole for the pens as the pen stand. The drug name was printed on the table top gift to help the doctor refer to the given name of the drug whenever the situation demanded and prescribe the same to the patients. After two to three weeks of prescribing the doctors were ready to prescribe the new drug without looking at the table top gift pen stand. The purpose of the gift as per the reminder concept was thus achieved by the pharma company helping both the doctors and patients, at the same time creating a win – win situation. The drugs which are sold over the counter (OTC) needs a different strategy of mass advertising where end users are educated through mass media and depending on their ailment the consumers can pick up the solution as no prescription is required from a doctor. Here since the decision maker is consumer and the influencer is the chemist or storekeeper the strategy is designed accordingly. Instead of the ‘concept’ the product manager here looks for the best ‘connect’ to convey the message to the target audience. With the boom in the IT industry and scores of people working on the monitors the fatigue of eyes due to dryness is a common syndrome. Initially what was supplied as eye drops to help lubricate the dry eyes was a big hit and manufacturers sensed a gap in the market for more choices for various levels of complaints depending on the level of dryness and involvement of the suffering consumers. Manufacturers started offering varied choices claiming ‘instant calm’, ‘cools’, ‘hydrates’ and ‘refreshes’ and even comparing the dry eye treatment equivalent to a visit to the eye spa! Once the initial launch is completed the product team can decide various eye mask corporate gifts to influence the new consumers to try out and become regular users of their brand! The promotion strategy between the prescribed drug and OTC (over the counter) works differently depending on the concept and the connection! For OTC manufacturers the strategy was to win over the unclaimed patient who were yet not visiting the doctors but nevertheless were suffering from dryness of the eyes. The manufacturers depending on the doctors for prescription needed the solution concept as ‘high hydration’, ‘high water retention’, ‘long lasting relief’, ‘comfortable blink without blur’ and ‘feel the well wet experience’ to differentiate their product and thereby their premium offering through doctors. Please feel free to send us your brief concept by email with the quantity and the budget to visit you with various choices for your shortlisting. Once shortlisted you will get a prototype of the gift for your approval to make it easy for you and your team to take a final decision!